Open evenings in Copenhagen and Aarhus are good opportunities for getting in touch with the experience and practice of Moving Meditation. On our longer retreats, you can get more familiar with Moving Meditation and use it to seriously open new doors in existence. This time with focus on the existential process of listening. Move ‘n Act, Grønnegade 93E. 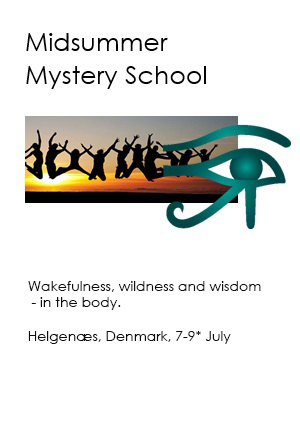 Sat 3 Feb and Sat 3 March, 7.00 – 10.00 p.m.
“Wakefulness, wildness, wisdom and friendship – in the body.” It has been our tradition to offer a 3-day seminar and “mystery celebration” with this title, around midsummer for several years. In 2018 the Moving Meditation sessions will be part of a longer and more diverse “contemplative summerschool” project instead, with a wider range of teachers, approaches, experiences and approaches. This will be double fun and double depth – all the best from Moving Meditation, plus Buddhist meditation, Harmonic voice work, philosophical reflection and much more. Read all about the seminars, the dream team, the idea of Nordic Folk High School and much more – here. Dancing a loving goodbye to old patterns – and opening space in life for new movements.